where are the vacuum lines for the blower located? 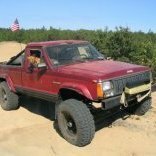 i also have an 86 2.5l MJ and i really wanna do a 4.0 swap, if i bought a donor xj off craigslist for a good price what else would i need to buy? i am on a highschool budget, and for my senior year we have to do a big 80 hour project and this is what i want to do, which will be over the summer! So basically what I want to know is how much more challenging is a 4.0 swap on an 86, and what else will i need to buy besides the donor cherokee and gaskets? what was the price on the tie rod, TRE, and sleeve? does it matter what year its from? EVERYONE come to the trails in columbus!